Published in Tribune – Summer Reading Issue (no 2406), 11 December 1985. Mick Miller (right) and Dennis O'Rourke during the filming of 'Couldn't be Fairer'. The Northern Territory’s recent campaign against the return of Ayers Rock to its traditional owners underlined the racism inherent in large sections of the white community in Australia. The “Ayers Rock for all Australians” (sic) campaign was not an isolated incident. Attacks on the basic human rights which Aboriginal people have gained through years of struggle are under attack across Australia, from both governments and corporate interests. But nowhere is it as vicious, or as overtly racist, as it is in Queensland and the Northern Territory. Couldn’t Be Fairer, a new film by Australian filmmaker Dennis O’Rourke confronts the racism of the Queensland government and the white community of Northern Queensland. What emerges is a powerful statement, graphically illustrating the hypocrisy which seems to be the cornerstone of race relations in Queensland. O’Rourke has been internation­ally recognised as one of the most perceptive filmmakers on tensions between western and traditional culture. His films include Yumi Yet (1976) and Ileksen (1978) about the granting of independence and the first election held in Papua New Guinea. Yap … How Did You Know We’d Like It (1980) examined the effect of American television on the small Micronesian island of Yap. His most recent film, Half Life, which will be commercially released early in 1986, is a devastating account of the US nuclear weapons test program on the Marshall Islands. It concentrates on the effects exposure to highly radioactive fallout from the tests has had upon the inhabitants of the island. O’Rourke was originally commissioned to make Couldn’t Be Fairer for the BBC program Third Eye, which is a series of programs designed to allow people from the third world to describe their conflicts with western culture. As O’Rourke told Tribune, “North Queensland, for Aboriginal people, could be regarded as the third world. What exists there is basically a colonial situation, both on and off the reserves”. A major strength of the film is the power and commitment of its narrator, Aboriginal activist and chairperson of the North Queensland Lands Council, Mick Miller. 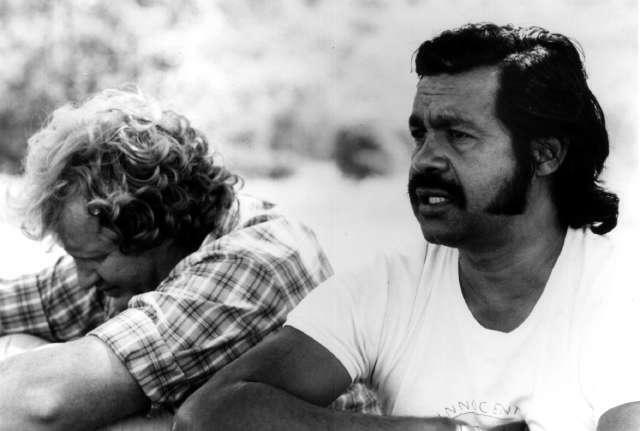 The film follows Mick through Northern Queensland as he talks to his own people and discusses the effect that commercial development, such as mining and tourism, has had upon Aboriginal communities. We see how white Queenslanders effectively marginalise Aboriginal people, pushing them to the outskirts of white society. The alcoholism, sexual exploitation of Aboriginal women, and the degradation which is the result of two centuries of white oppression is in sharp contrast to the glimpses we are allowed of white Queenslanders in the film. Joh Bjelke-Petersen, and members of the Queensland government, feature prominently in the film. In fact, the title comes from a statement from the Queensland premier regarding his government’s treatment of Aboriginal people. “Treat them the same as everyone else — couldn’t be fairer.” Mick Miller, time and time again, emphasises the hypocrisy and racism which underlies such a statement. Unfortunately, Couldn’t Be Fairer shows that Bjelke-Petersen’s racism is shared by many whites in Northern Queensland. Hotel workers, white drinkers, police, mining companies, even workers in the tourist industry show, by their statements and actions, that Aborigines are not treated the same as everyone else in the Sunshine State. Couldn’t be Fairer was filmed over a period of three months in late 1984. Dennis travelled around northern Queensland with Mick and members of the North Queensland Land Council, filming and interviewing people both on reserves and in towns. Later, when the film was being edited, Mick was often in Canberra in his various official capacities, so he was able to take an active part in the cutting of the film. Problems arose, however, when the final version of the film was delivered to the BBC. It was decided that sections of the film were “too shocking” for English TV audiences. As a result, scenes dealing with drunkenness, the sexual oppression of Aboriginal women, and the degradation which many Aborigines had been forced into, were cut from the version which went to air in England. In all about half the film was edited out without the permission of Dennis or Mick.